Have you dodged the bullet this holiday season? You know what I am referring to, right? Poinsettias! Allow me to explain. All of your friends know you are an avid gardener. With all the vegetables you give away each summer, you hold the status of Gardening Guru. You have likely responded to plant emergency calls, and resuscitated an ailing house or garden plant. It seems only logical for a gardener's friend to assume the perfect holiday gift to get the Gardening Guru is a Poinsettia. Now you, the gardener, have the attention of everyone as you do your best to keep a houseplant alive in the middle of winter. Why is that so hard? Mainly because that plant is being taken from the perfect growing environment, a greenhouse with state of the art climate controls and cultural care, to a less than ideal home in the middle of winter. 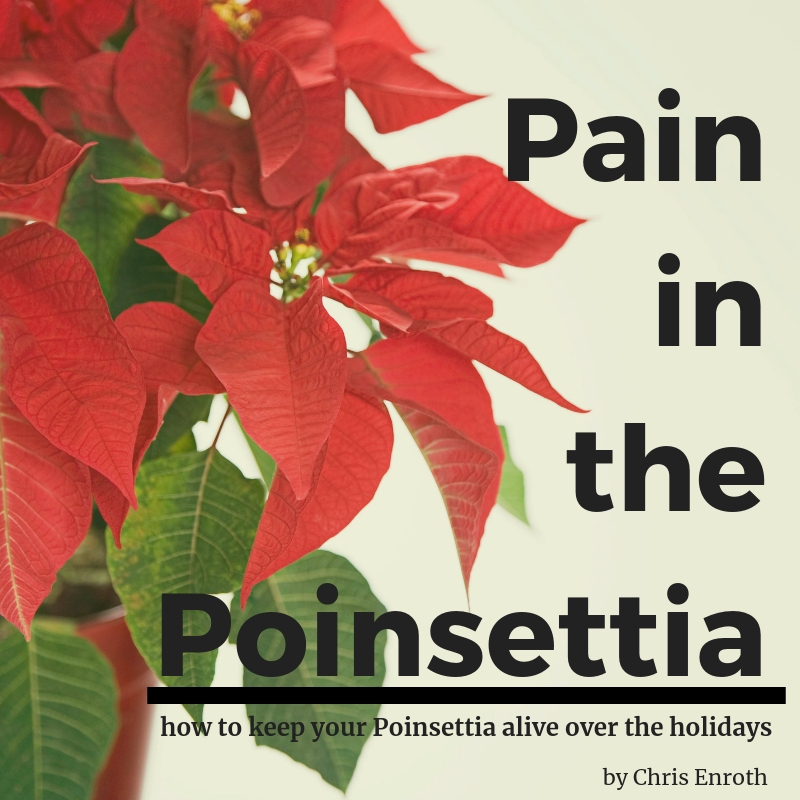 Garden Guru or not, there are ways to keep that Poinsettia alive during the holiday season. And to do that, we need to know a bit about where the plant comes from and its history. With known cultivation going back to the Aztec civilization, Poinsettias are native to Southern Mexico. In 1825, President John Quincy Adams appointed the first US Ambassador to Mexico, Joel Roberts Poinsett, a politician with an interest in botany. Wandering the countryside of Mexico, Poinsett took cuttings from a large beautiful shrub with red flowers growing next to the road. He sent these to his greenhouse in South Carolina, thereby introducing the Poinsettia to the United States. As the plant became more popular in the US, it garnered the official name of Poinsettia in honor of Joel Poinsett. Today Poinsettias are the most popular retail potted plants in the US with over 34 million sold each year. Most Poinsettias are purchased in the six weeks leading up to Christmas. In its native range in Southern Mexico, Poinsettia blooms during December, where the plant was traditionally used to decorate churches to celebrate Christmas. By manipulating a Poinsettias exposure to light, greenhouse growers were able to simulate southern Mexico conditions to trigger flowering and create a popular off-season nursery product for the holidays. Make sure it is wrapped properly because exposure to low temperatures even for a few minutes can damage the bracts and leaves. Remember these are tropical plants! Place the Poinsettia in indirect light. Keep the plant from touching cold windows. Ideally, Poinsettias require daytime temperatures of 60 to 70°F and nighttime temperatures around 55°F. High temperatures will shorten the plant's life. Move the plant to a cooler room at night, if possible. Check the soil daily. Be sure to punch holes in the decorative foil so water can drain into a saucer. Water when the soil is dry. Allow water to drain into the saucer and discard excess water. These tips will keep your Poinsettia alive through the holidays or at least until the relatives leave. Check back with the Good Growing column next week for Ken Johnson's advice on keeping your Poinsettia alive for months or years and how to get the plant to rebloom. Good Growing Fact of the Week: The word Poinsettia is traditionally capitalized because it is named after a person, Joel Roberts Poinsett.